Wednesday May 14th 1902 Fred went away yesterday to have his eyes declared. Fany washed and churned for me and I went] to town in the afternoon. I had every tooth treated and was up home a little while. Mother and I rode over to Mrs Pratts. I took her $1.00 church money. Mollie went to town to stay all night. I sent Lydia Mason a [slumber?] [safe?] today. 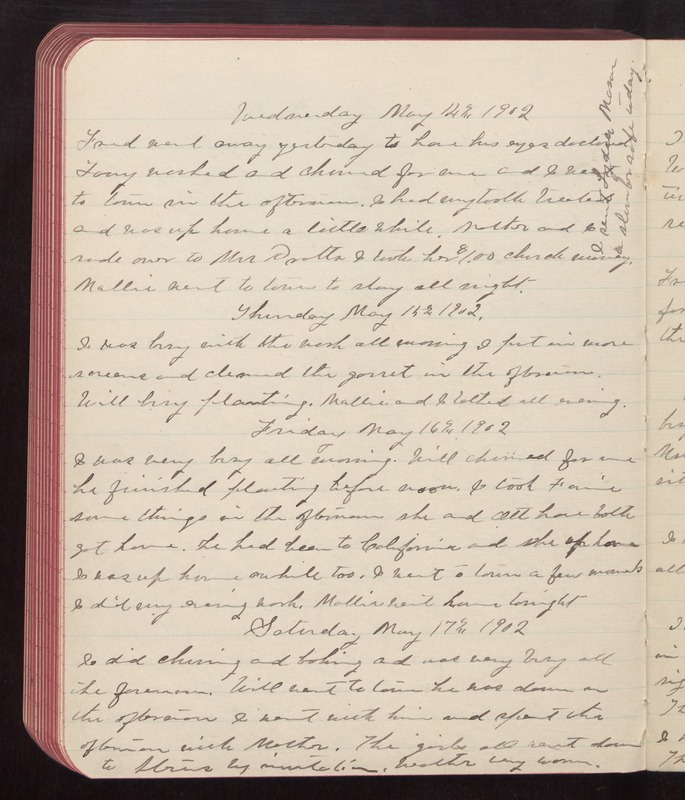 Thursday May 15th 1902 I was busy with the work all morning. I put in more screens and cleaned the garret in the afternoon. Will busy planting. Mollie and I talked all evening. Friday May 16th 1902 I was very busy all morning. Will churned for me. he finished planting before noon. I took Fannie some things in the afternoon. she and Ott have both got home. he had been to California and she up home. I was up home awhile too. I went to town a few moments. I did my evening work. Mollie went home tonight. Saturday May 17th 1902 I did churning and baking and was very busy all the forenoon. Will went to town. he was down in the afternoon. I went with him and spent the afternoon with Mother. The girls all went down to Stevens by invitation. weather very warm.